Are you a current BGSU international student that is not travelling this spring break? International Programs and Partnerships Office will like to extend an invitation for you to join us enjoy a delicious hot meal on March 20th. There will be plenty of food, drinks,games and fun! 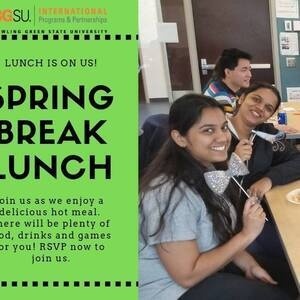 FREE FOR ALL BGSU INTERNATIONAL STUDENTS. Do not miss out!